If you take a look at agency culture videos, you’ll often find shots of coworkers collaborating on a whiteboard, or laughing over a beer. Videos that talk about culture but don’t necessarily pay it off, that end up looking generic and a dime a dozen. So we were thrilled when the team at Boston and Philadelphia based agency Allen & Gerritsen took a new approach to that old model, by articulating their agency culture through a whole different kind of storytelling, one that differentiates them as an agency. 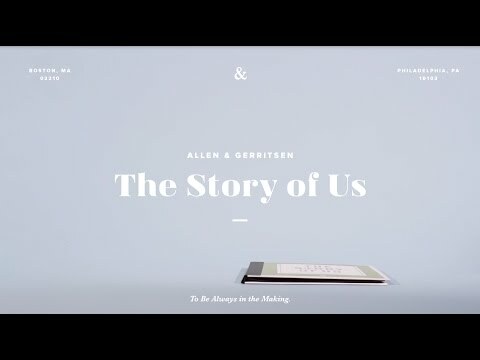 We spoke with A&G’s Associate Creative Director, Hilary Sedgwick to learn more about the inspiration -- and unique execution-- behind their latest culture video: The Story of Us. What was the main inspiration for this culture video? At Allen & Gerritsen, we strive to be always in the making and wanted to visually pay off that core value by carefully hand-crafting every single piece of our story. We pride ourselves on being nimble, agile craftsman and created each scene so it would resonate with how we are within our walls, and how we collaborate with clients outside our walls. We also knew that to capture what truly makes us who we are as an agency, it was important that we include everyone, so we shot scenes in both our Boston and Philadelphia offices. By collaborating cross office, we engaged different craftsmen for every scene. Yeah, it was an ambitious idea, but it was important to all of us to make this an all agency effort that advocated for who we are, what we do, and how we do it. The concept was all about taking everyday aspects of life at A&G and show how we approach them differently from other agencies. Whether we’re sending emails, dialing into conference calls, or even crashing a drone (yes, that happened), we give our work everything we have while still trying to keep things fun – a notion we believe comes through in the execution. Over the course of two weeks and a lot of late nights, it was all hands-on deck to make it a reality. We handcrafted pizza boxes and recreated a scene straight out of Flashdance. We crafted our own coloring books and built a coffee cup pyramid fountain; every scene on our shot list had a team behind it and a payoff that was pretty amazing and really spoke to who we are. There were paper cuts, emails (so many emails), laughs and memes. And through it all, we discovered new secret talents we never could have imagined. What was the goal for the video? A&G doesn’t fit the typical ad agency mold - we’re different and we celebrate being that way. And we look for talent who want to be part of that and contribute to it. Our culture is all about pushing and challenging ourselves to make cool stuff, so that’s what the video is — it’s the true, creative story of how we inspire and motivate one another to produce awesome work, every day. Created with over 50 short cuts, some stop motion, all proof points for how we work and create together, we decided these little vignettes allowed anyone to imagine themselves immersed in the A&G lifestyle and allowed the viewer to see themselves as a part of who we are as an agency. We wanted talent to watch and recognize that starting a career in advertising can be so many things. It’ll never be boring. It’s not a desk job. It’s a collaborative world where everyone adds something unique to the process, and where everyone is creative in their own roles. The input and output created such pride and camaraderie among the entire agency, it wasn’t just about one person, it was a true team collaboration across the board. One that truly became The Story of Us. What inspires you and what makes you do what you do? I’m inspired by work that makes the audience feel something and by creative problem solving. I know it sounds typical, but I’m also inspired by the people I work with every day. It’s unbelievably motivating to be surrounded by likeminded colleagues who have the drive to create something great. We collaborate and inspire, push each other and motivate each other to think differently; I see that happen every day. At A&G, it’s much less about what department you’re in or the title you have, but rather about us all working toward the same goal of creating something unique and amazing. That’s what is happening here at any given moment, and what makes me excited to be part of it.